Many Mercedes Benz owners have sentimental attachment to their prized luxury sedan and it is easy to understand why. 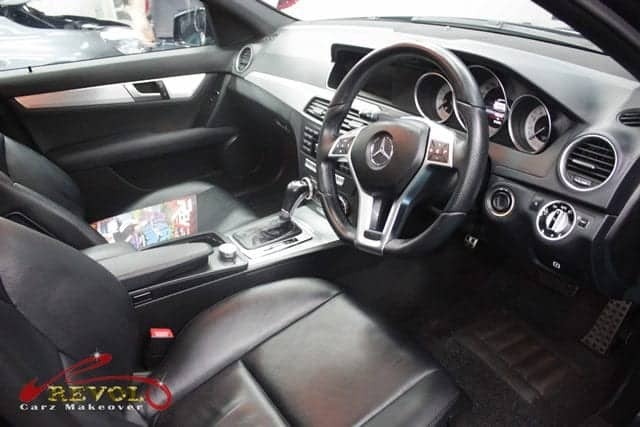 The popular Mercedes BlueEfficiency is indeed a great looking sedan to easily fallen in love with. 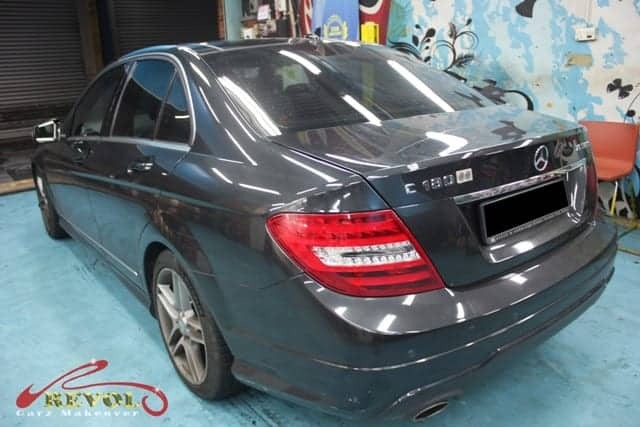 Arriving at Revol Carz Makeover is yet another Mercedes BlueEfficiency C180, for a full-car repainting with precision-matched original factory color code paintwork. To give the new coats of paint the absolute lasting protection and permanent luster, we always treat the surface with the award-winning, eco-friendly ZeTough Ceramic Paint Protection coating. BlueEFFICIENCY means reducing fuel consumption and CO2 emissions, saving on costs and protecting the environment. The overall impression of the updated C180 BlueEfficiency is undeniably extrovert and elegant. The dramatic exterior with the front end receiving a more prominent grille, combining sharp angles with graceful curves and high tech elements. Even the 17-inch alloy sports wheels fit tightly into the wheel arches, well matching the car’s proportions. 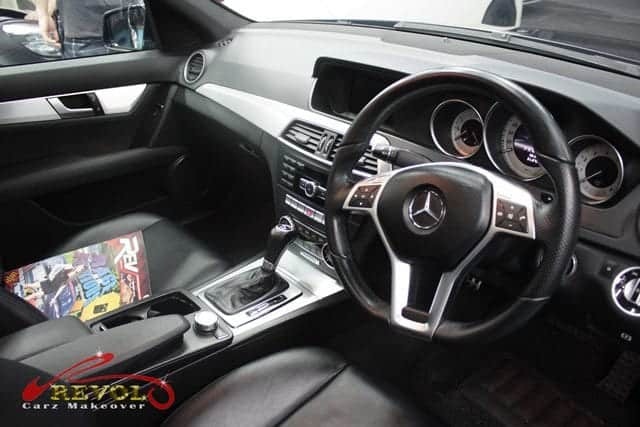 The interior is typical of Mercedes Benz, favoring a light and bright approach with generous stainless steel trims. 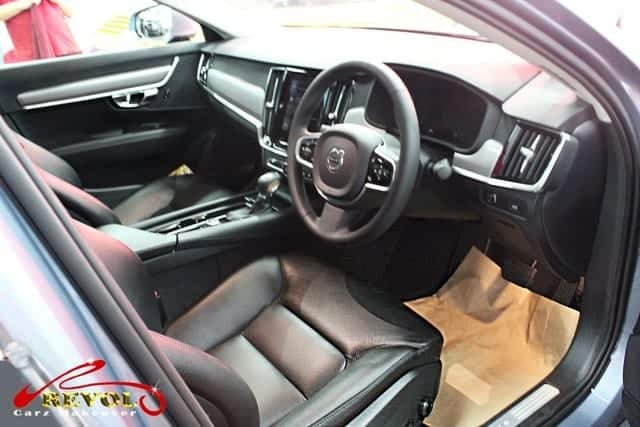 The seats are in luxurious Artico leather and the lavish equipment include Thermatic Climate Control, Auto Headlights, Parking Sensors, Bluetooth connectivity and multi-function steering wheels. Under the hood is the heart of the C180 beating with a 1597cc 4-cylinder quiet engine which is mated to a 7G-tronics transmission. The C180 BlueEfficiency accelerates the 0-100km/h dash at 9.9 seconds and a top speed of 225km/h. 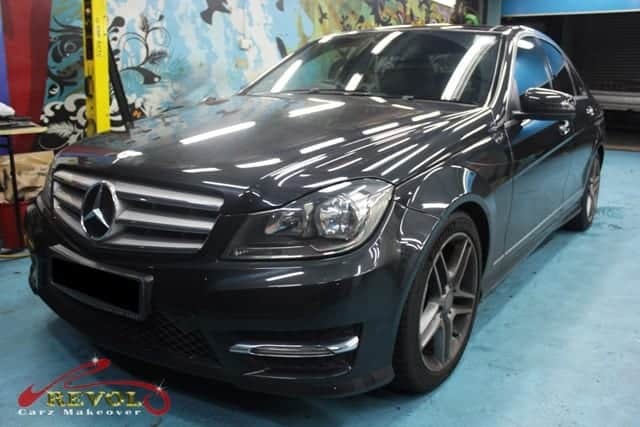 We are happy to post the following photos of the Mercedes C180 BlueEfficiency showing the dexterity of our professional makeover and making an elegant impression with the long lasting, ZeTough Ceramic Paint Protection. The C180 arrived at our workshop in a weathered condition. The inevitable scratches and dulling paintwork were the results of prolonged exposure to harsh tropical elements and lacking proper maintenance. The doors and wing mirrors would be carefully stripped for repainting works. 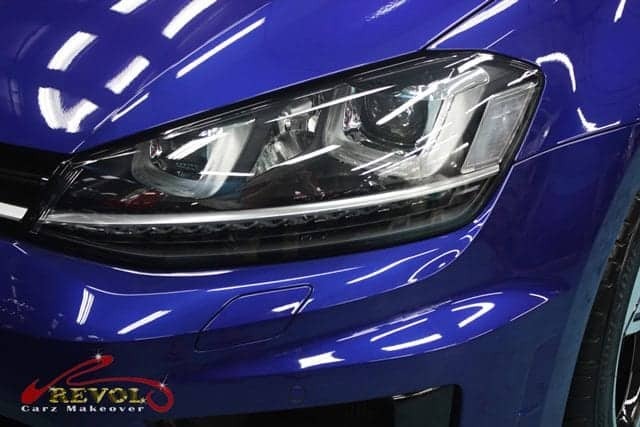 At Revol Carz Makeover, a total respray means we strip every possible part such as, the headlights, tail-lights, bumpers, grille, weather strips, bonnet, trunk and the wheels so that we leave no traces of the old paint. 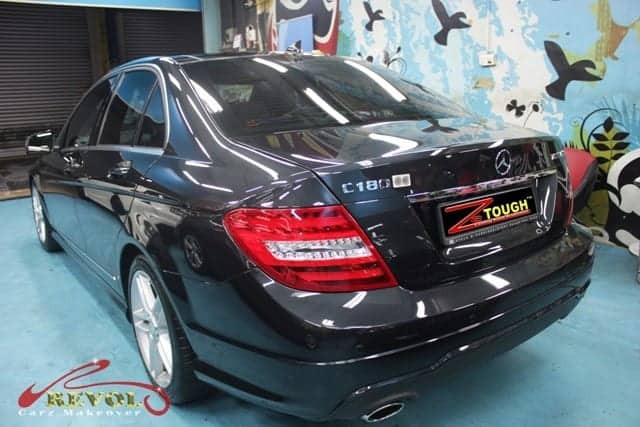 We feel the adrenaline presenting the finest ZeTough Ceramic Paint Protection coating works on the Mercedes C180. Achieving this stunning better-than-showroom condition is rewarding not only for the owner, but also for our dedicated team. Upfront, the C180 proudly holds its nose up high with the large iconic three-pointed Star badge, grille, head-lights and body in a breathtaking new condition after the ZeTough Ceramic Paint Protection coating. 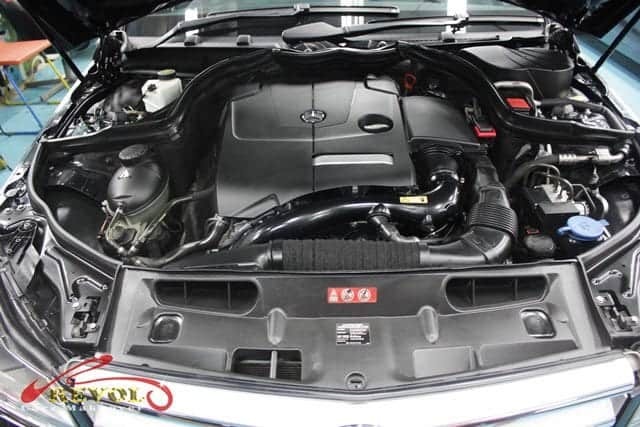 Our professional team paid a lot of attention in deep steam cleaning and polishing the engine bay with chemical-free products, bringing back an astoundingly beautiful condition. Despite being well-maintained, the interior needs extensive, skillful detailing. The interior is now completely sanitized, steam cleaned, leather nourished and restored with careful detailing. Scrutinize the superior finishing with ZeTough Ceramic Paint Protection coating. Whichever perspective you gaze at the C180, Revol Carz Makeover promises a long-lasting, better-than-showroom luster with guaranteed protection with the proven ZeTough Ceramic Paint Protection coating. The striking mirror-like reflections on the rear exterior are projected with eco-friendly, ZeTough Ceramic Paint Protection coating. 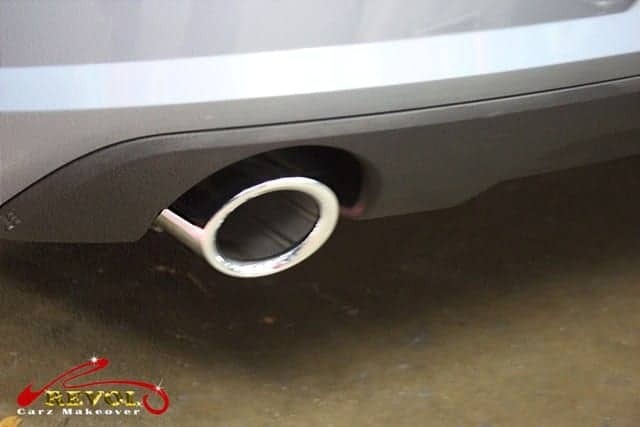 The dusty exhaust tips have been transformed to like mirror-finish after patient polishing. The dust laden wheel arches and wheels are ready to be dismantled for cleaning and polishing. Behold, all wheels are restored and polished to look brand new again. No more chips or scratches. See to believe! Our professional team’s expertise have successfully transformed the C180 BlueEfficiency into an exhilarating better-than-showroom masterpiece. 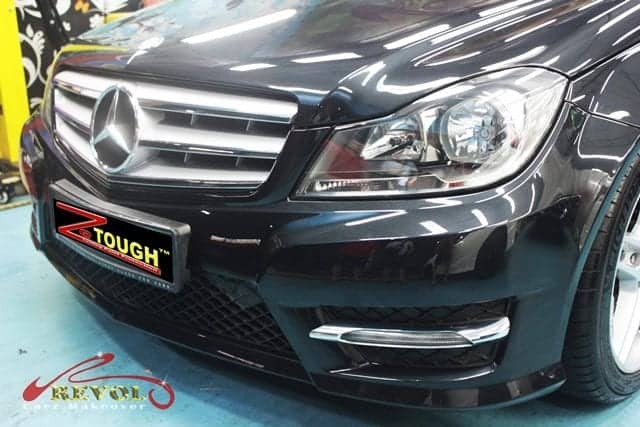 Applying ZeTough Ceramic Paint Protection is a delicate process that requires experienced groomers to achieve the desired better-than-showroom luster on a long term. 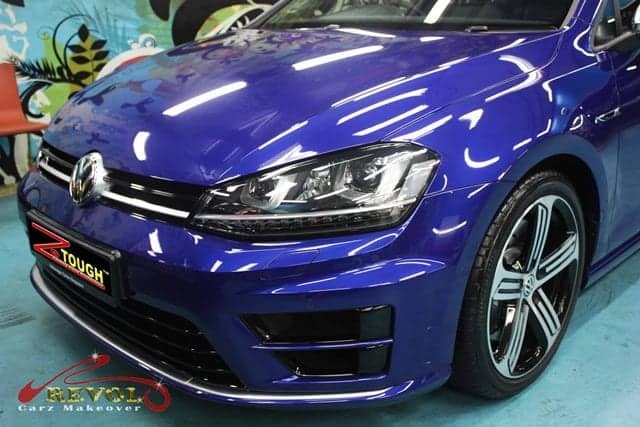 With the coating of the renowned ZeTough Ceramic Paint Protection, we guarantee your car’s paintwork gets ultimate protection with showroom mirror finish throughout your ownership. Maintenance after the coating is minimal. Considering giving your car a new lease of life? We can transform your car to an immaculate showroom condition too! 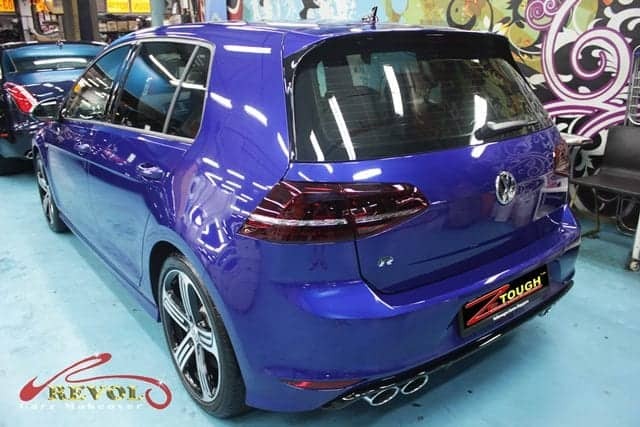 You are forgiven if you have mistaken this stunning Volkswagen Golf is being displayed at a showroom. It is no secret that our multiple award winning ZeTough Ceramic Paint Protection coating made an impression for such breath taking, mirror-like finish. Revol Carz Makeover professional grooming satisfies the most demanding driver for its reliable, long-lasting shine and paint protection. The 2017 Golf R has earned a 5-star overall safety rating from the National Highway Traffic Safety Administration (NHTSA). Another exhilarating high 5 for an impressive high marks. Thanks to the newly designed MQP platform, the Golf R’s exterior contours are bold and sporty. The new radiator grille, gloss black brake calipers, 19-inch Cadiz Alloy Wheels, duel chrome exhaust tail-pipes and the prominent R logos are alluring. Step inside and you would immediately awe at the luxurious interior finishes usually found in luxury cars. 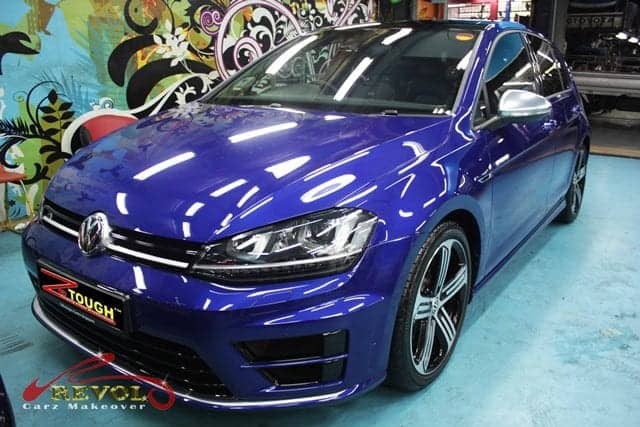 Golf R is one of the quietest cars in its class with comprehension sound-proofing and acoustic windscreen filtering out outside noise. 0-100km/h in 5 seconds flat is serious firepower that the Golf R is licensed to thrill. 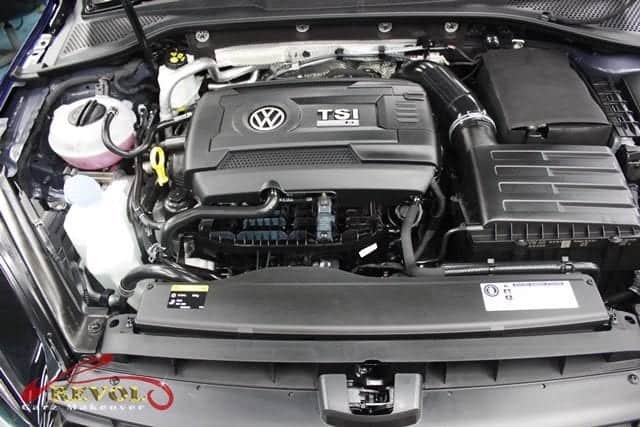 The 2.0-liter TSI four-cylinder engine, mated to a 6-speed DSG transmission, generates 206kW of sheer power at 5100-6500 rpm and peak torque of 380Nm at 1800 rpm. Revol Carz Makeover professional grooming with hours of meticulous hand-polishing creates a flawless mirror-like finish that ZeTough Ceramic Paint Protection Coating is famed for. See the stunning results of ZeTough Ceramic Paint Protection Coating. The difference is dramatic isn’t it? The new radiator grille, gloss black brake calipers, air intakes and the alluring 19-inch wheels create quite a punch. The Xenon headlights produce a light spectrum similar to that of daylight in superior visibility. We have polished the lens to enhance even higher visibility. Cleaning and polishing the engine bay to showroom condition is always the favorite part of our make-over assignment. The Volkswagen Golf R’s firepower boasts of a 0 to 100km/h sprint in 5 seconds flat. Impressive! 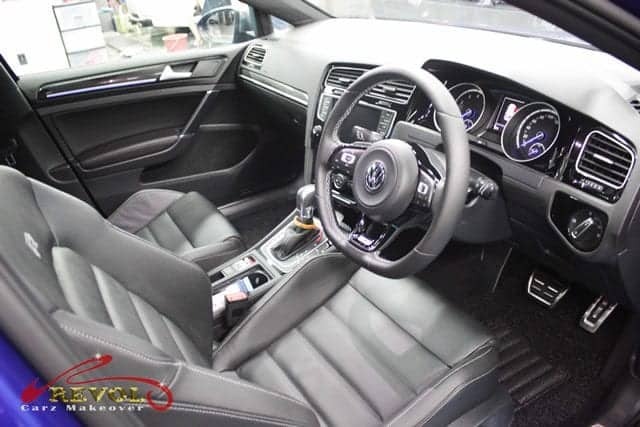 The spacious interior of the Golf R is amazingly clean and inviting after our careful and loving detailing. The multi-function leather sports steering wheel, black Vienna Leather appointed sports seats are all revived to a premium level. Once you get into the seat, you won’t want to leave. Perfectly cleaned Blue accent gauges add to the already sleek interior style. 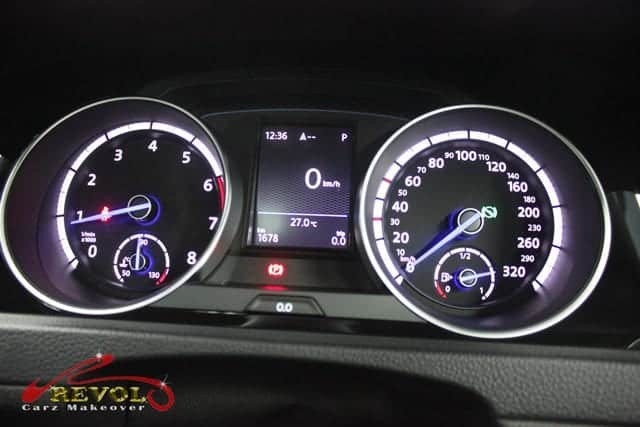 The gauges in the Golf R are illuminated in blue light. You can’t help gazing at her seductive rear after our un-compromised grooming workmanship with ZeTough Ceramic Paint Protection coating. The boot has a large capacity of 380 liters, and this can easily be expanded by folding down the split rear seats. A review camera is cleverly hidden behind the Volkswagen badge. The R’s dual quad exhausts deliver a more refined yet beastly roar after careful polishing. Volkswagen R’s 19-inch Cadiz Alloy Wheels roll in style. How pleased the owner must have been to have his Volkswagen R returned with such breath-taking restoration. How about giving your car a new lease of life too? Revol Carz Makeover is the right choice. Visit us to know more about our affordable and transparent services. Check out the 2017 Volvo S90 T5 Momentum that rolls out of Revol Carz Makeover. See the dramatic difference! 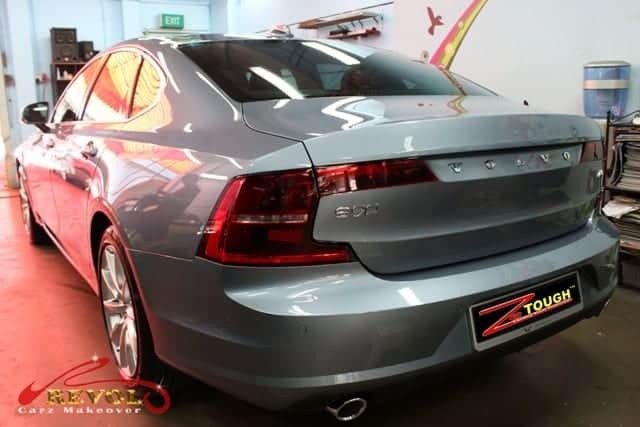 The S90 merits a long look after it has been treated with the award-winning, ZeTough Ceramic Paint Protection coating. The new Volvo S90 Momentum redefines luxury with elegant Scandinavian autonomous design and technology. The standard features include Drive-E 2.0liter I-4 250hp intercooled turbo engine, eight-speed Geartronic automatic transmission, 4-wheel anti-lock ABS brakes, integrated navigation system, cruise control, distance pacing, ABS and driveline traction control and last but not least, 18″ aluminum wheels. The interior is beautifully built with super modern yet not loud or flashy with creativity in the design. Trims include a partially digital instrument cluster with an eight-inch screen, birch wood inlays and leather trim on the door panels. Acceleration from 0 to 100 km/h comes in 6.8 seconds with a top speed of 230 km/h. 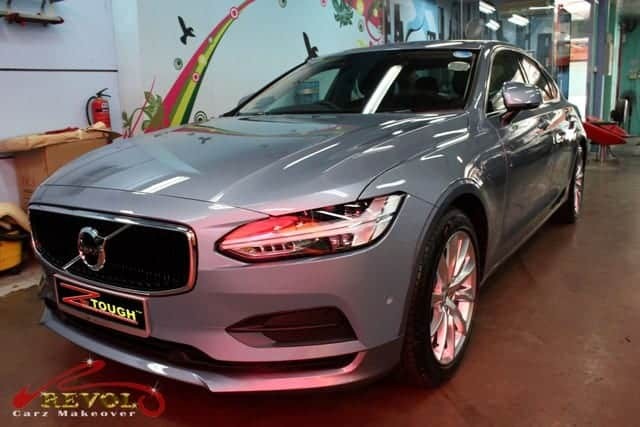 The spectacular Volvo S90 T5 merits a long look wearing the award-winning, ZeTough Ceramic Paint Protection coating. 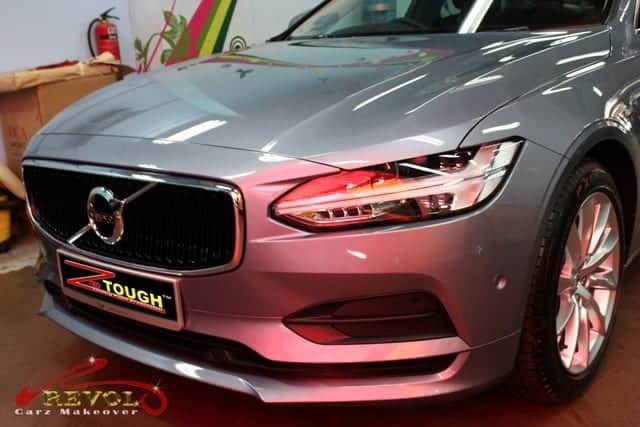 The most striking aspects of the front view featuring Thor hammer shaped LED headlights and the iconic Volvo grille. 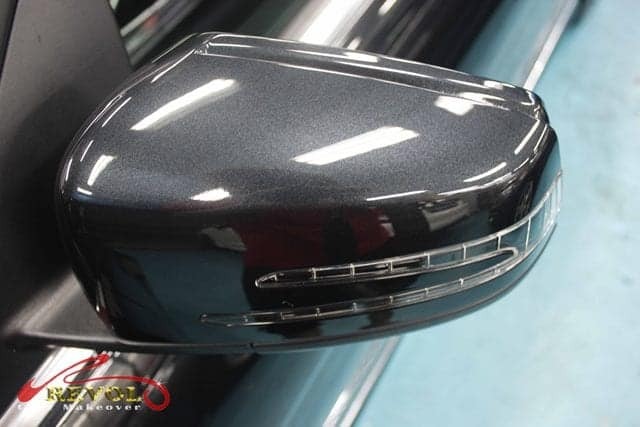 Hours of meticulous polishing and ZeTough Ceramic Paint Protection coating creates the flawless mirror-like finish. Equally eye-catching are the highly polished and restored Automatic LED Headlights. 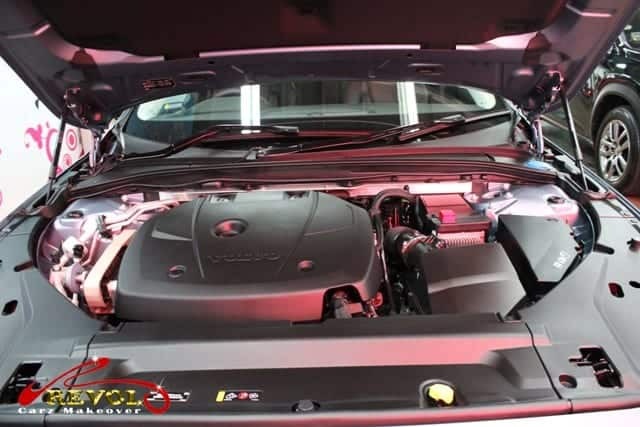 Under the hood is a super-cleaned 250-hp 2.0-liter intercooled turbo engine with 258 lb-ft of torque and a profound oomph after ZeTough Ceramic Paint Protection coating Midas touch. 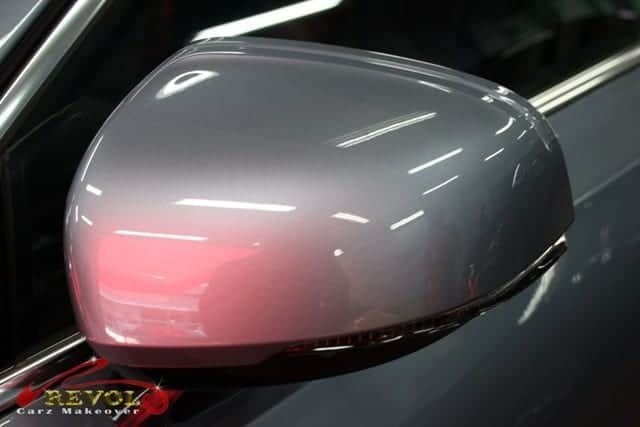 Bringing the shot closer and you will awe at the incredible mirror-like gloss on the wing-mirror after the ZeTough Ceramic Paint Protection coating. Inside the modest S90 is super modern yet not loud or flashy with creativity in the design. Trims include a partially digital instrument cluster with an eight-inch screen and Nappa leather upholstery and trim on the door panels. Detailing the interior to a showroom look is very rewarding for our professional team. The rear end is revved up with ZeTough Ceramic Paint Protection coating. The C-shaped tail-lights are alluring after polishing. The finishing touch of the makeover is never complete without intense polishing the exhaust tail pipe. 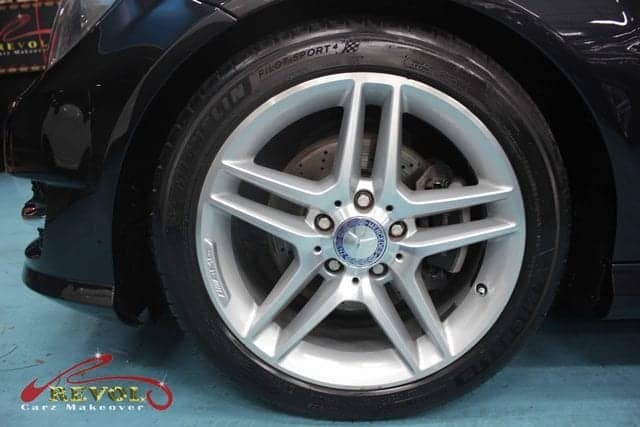 We have the expertise to restore the aluminum wheels. No more dust. No more kerb rashes. No more scratches. All brand new again. Have you given your car a reliable paint protection coating yet? Or perhaps you are contemplating giving your car a new elegance with a makeover. With the proven coating of our Eco-friendly ZeTough Ceramic Paint Protection, we guarantee your car’s paintwork gets unparallel protection with the guaranteed showroom shine throughout your ownership. Maintenance after the coating is minimal.